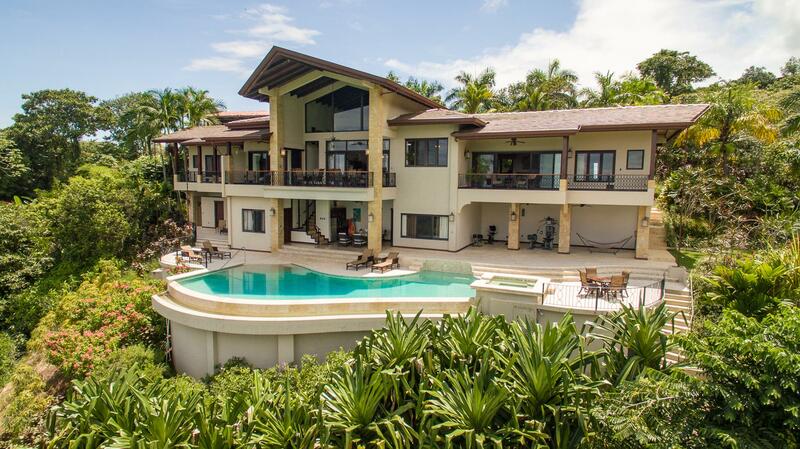 Casa Dolce Vita is one of Manuel Antonio\'s premier luxury rental villas and provides guests and owners a breathtaking balinese style villa in the heart of Manuel Antonio. The unique architecture of this stunning villa seamlessly combines luxury with organic materials like tropical hardwoods and stones to create a luxurious but natural backdrop from which to soak in the INCREDIBLE views of Manuel Antonio National Park, the Pacific Ocean and rainforest teeming with wildlife. There are a total of 4 bedrooms including, two master suites, each with a king size bed and customized on suite bathroom. There is one master on the ground floor of the home which spills out to the pool and deck area, a second master on the second level of the home with jaw dropping views. The third level of the home hosts the great room whose hand crafted stone and wood columns and beams support a 15 foot ceiling detailed with local bamboo and woven matting that is open to the cool Pacific Breezes and rainforest. It is not uncommon to have monkeys come running across the balconies in this amazing common space which host the cooks kitchen raised dining area and spacious living area. There is a third bedroom on this level as well, with a full bath. The top floor of the home has the fourth bedroom and full bathroom and panoramic views that seem to never end. This home is an IDEAL opportunity for a family, couple or investor looking to have a second home or vacation property here in Manuel Antonio which is fully managed and producing very strong annual returns. The property has a world class management team and a proven track record of rentals which is generating over $60,000 per year in NET returns for the owners, with a totally hassle free ownership and plenty of personal use time as well. Dolce Vita is one of the best priced homes on the exclusive Pacific Canyon Drive as well, with an asking price several hundred thousand dollars below neighboring properties making for a very unique and well priced opportunity.